Bread rolls homemade with yeast are the crowning touch to a wonderful meal. Bread goes well with almost every meal. 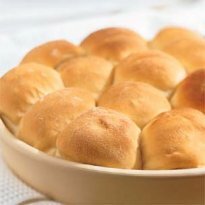 These dinner rolls are delicious. Here is one of our family favorite bread recipes. In a saucepan, melt butter; remove from heat, add the water, milk, sugar, salt and eggs. Add mixture to dissolved yeast, stirring well. Add 10 cups of the flour; Mix well. Knead by hand for about 5 minutes, adding the remaining flour as necessary. Form the dough into a ball and oil the outside of the ball to prevent sticking. Place in bowl. Cover and let rise until doubled, about 1 to 1 1/2 hours. Preheat oven to 350F. Grease baking pans. Punch dough down and shape into rolls. Place in prepared pans, cover and let rise for 1 to 1 1/2 more hours. Bake for 12 to 15 minutes. Makes 6 dozen dinner rolls. NOTE:After you have shaped the rolls, you can place them on foil pans and freeze them in whatever quantity is best for your family. When you need homemade bread, you can just pop them into the oven. In a small bowl, stir the yeast and water together and let stand until bubbly on the top, 2 to 3 minutes. In the bowl of an electric mixer, combine the flour, gluten, salt and yeast mixture. Using the dough hook attachment, knead the mixture on medium-low speed to form a soft, smooth and elastic dough, 8 to 10 minutes. Turn the dough out onto a lightly floured surface and shape it into a ball, then return it to the bowl. Cover the bowl tightly with plastic wrap, set in a warm place and let the dough rise until doubled in volume, about 1 1/2 hours. Gently punch the dough down to remove the larger air pockets, turn it out onto a lightly floured surface and let rest for 5 minutes. Divide the dough into 8 pieces and, with floured hands, gently shape each piece into a ball, stretching the sides of the dough down and under. Pinch the seam beneath each ball to seal it. Dust a round cake pan with cornmeal. Place 7 balls of dough in a circle, seam side down, and place the last ball in the center. Cover with a plate and let rise until doubled in volume, 45 minutes to 1 hour. Bake until the rolls are golden, about 45 to 50 minutes. Transfer the rolls to a wire rack and cool slightly before serving. Pumpkin cranberry bread is an idea for dessert. Top with a little vanilla ice cream for a real taste treat!